Announcement Sorry, I am away from my studio between April 10 and April 24. Shipping resumes April 25. Thanks for your patience! Featuring gift boxes and ornaments made from aluminum beverage cans! This shop also has vintage blank white clothing, and vintage collectible items. I love making things from aluminum! Here you will find my own original designs for gift boxes and star ornaments made from post consumer aluminum! I have almost 600 varieties to choose from! Also in this shop, closeout of Premium, plain white BLANK garments for dye, paint, applique, decoration DIY. Hard to find UNIQUE baby infant toddler styles! Closeout Wholesale Prices, these are vintage garments, all over 20 years old. They were previously painted and sold in boutiques across the country at premium prices. Now you can paint your own! For years, i painted kids and some adult clothes and sold them under the name Lizard Skins. You may have seen or purchased them in fine boutiques across the country. This is a closeout of the last blank (plain, white, prepared for dye or decorating) items i have in stock. See how great these dye! Sorry, I am away from my studio between April 10 and April 24. Shipping resumes April 25. Thanks for your patience! This was given as a Christmas present and it was loved! The mail bag this morning. I have my own official sack, to help the post office. Sort of a Santa thing . This is light holiday traffic. But i am alrrady running out of popular brands. So het your order in soon! 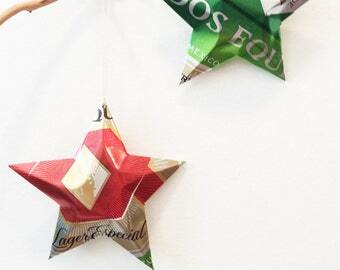 Churning out stars from beer and soda cans....hoping you have had a wonderful Thanksgiving! New variation on PBR stars. This years artist of the year cans with Gaijin the Artist’s great artwork! I have always loved using recycled materials, and was intrigued with the thin sheets of aluminum that could be cut from a beer or soda can. But they were so sharp! 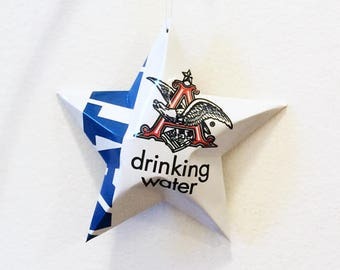 I started making these little star ornaments years ago, and discovered how to fold the edges back and make them safer for my family to handle. Previously i had tried to shape plain cut stars, but even using die-cutting machines, the edges remain so sharp, we had to be very careful. Then I figured out how to fold the edges of the stars, so they are more comfortable to handle. 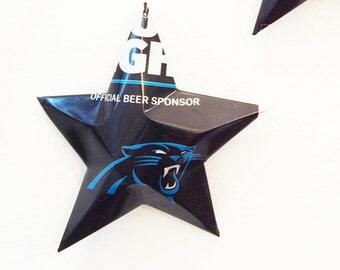 It also lends a more dimensional look to the star. After making them for my family and friends for a few years, i began selling them here. Soon after, looking for Valentine's gifts, i designed the tiny aluminum boxes. The kids took them to school for their teachers, with a few pieces of candy in them, and an exclusive product was born! The boxes are also just cut and folded, with no glue or other adhesives. They now come in the candy box shape, and a gift card shape. For the most unique gift wrap you'll find! Because I care about the earth and my carbon footprint, all aluminum cans are post consumer recycled. Each can is carefully cleaned and cut open, by hand. Just recently, as you can see from the video, i have started using electric scissors, which make things little easier on my hands! Only the thin sheet wall is used. After cutting, the sheets are cleaned again, then each star or box is cut from the sheet, by hand, this time with regular scissors; and hand shaped. I try to make the largest star possible from each sheet, and because each can might be cut a little differently, each one does vary. I also try to use as many other recycled products as possible, including shipping packages. Again, in reverence for the Earth and in an attempt to minimize packaging and waste, FREE GIFT BOXES are available, upon your request! Thanks so much for taking the time to read the story of my recycled aluminum crafts! Love the Earth! I can only ship to the address shown on the Paypal and/or Etsy invoice. So if you are sending a gift, you will need to put the correct shipping address there when you check out. If you do not, I will need to either ship to the address shown on the invoice, or cancel the transaction. Of course, if I cancel it, you can always do it again, and make sure the correct address is shown there. 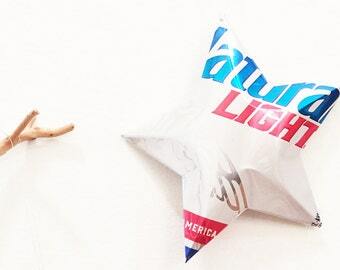 The Aluminum Can Star Pattern is NOT a project for small children, the can edges are very sharp! This is an original pattern. Use and Copyright Statement: Once you have purchased the PDF, you may use the PDF file to make these for yourself or for gift giving. If you use this pattern for retail sale, please credit LizardSkins; like this: “Project by LizardSkins.” You may not sell or give away the PDF file. Distribution of any part of the pattern and corresponding instructions, including the template, either orally or in writing, is expressly prohibited. Use of this pattern to derive a similar pattern for sale is expressly prohibited. I do not make these clothes. Some of them are my design, sewn for me. Mostly they are from manufacturers that are no longer in business. They were purchased in bulk (by the gross -that's 12 dozen at a time,) but years ago, when i made a business of this, i sold dozens of them. These are CLOSEOUT DESTASH, the LAST of what i purchased years ago. Some of them I only have a few of. First come, first served. All date to 1993, or earlier. While I offer full customer service, of course I do not always have replacement items. Please remember that aluminum cans are salvaged, recycled items, from which real people enjoyed a beverage. There may be scratching or fading, or other small wear on your items. Every can is cleaned thoroughly, and disinfected, before crafting! Items being returned require pre-authorization. (see above for terms) Please convo using etsy's system, or email me before returning. Returns must be returned in the same condition it was sent, within one week of receipt. Out of concern about our environment, and I use recycled packaging whenever possible, but for plain white blank clothing, I try to always use new, fresh envelopes or boxes or line them with plastic to keep the item fresh. These envelopes are tough and durable and can be reused...For our children and our earth: Please recycle! Choose PayPal, or your credit card at checkout! I ship daily, and try to ship on the day following your purchase. Most of the items in this shop are post consumer recycled. The same with packaging. Please tell me if that offends you BEFORE I pack and ship your item. Thanks. Out of respect for the environment, and in an effort to conserve paper, PACKING SLIPS ARE NOT INCLUDED unless you request one, or put a 'GIFT MESSAGE" at checkout. Gift boxes for stars are available, as an option at checkout, select from the drop-down shipping menu box. THERE IS NO CHARGE FOR A BOX, BUT IN AN EFFORT TO REDUCE, REUSE, RECYCLE, A GIFT BOX IS NOT INCLUDED UNLESS YOU REQUEST ONE! Thanks for saving the Earth for our children!. As previously stated, most of the packing and shipping materials used are recycled, in keeping with the theme of the shop. I prefer US mail, please tell me if you do not.